While he had been the Univ. of Pittsburgh’s all-time passing leader, there were questions about Marino and, as part of a highly-touted class of available quarterbacks, he fell to the Dolphins as the 27th pick in the first round (and the fifth QB). Marino quickly put the doubts to rest, taking over from David Woodley as the starter after several relief appearances, with the club at 3-3, and passing Miami to 9 wins in the final 10 games. Marino displayed a strong arm and quick release, making up for a lack of mobility, as well as being a quick study in reading NFL defenses. Dolphins went 12-4 to finish first in the AFC East. Lost AFC Divisional playoff to Seattle Seahawks (27-20). Marino followed up his fine rookie year with a brilliant 1984 season in which he set NFL records for passing yards (5084) and TD passes (48). The Dolphins were AFC Champions, although they lost to the 49ers in the Super Bowl. He had three more 4000-yard passing performances in the next four years and threw 44 TD passes in 1986. 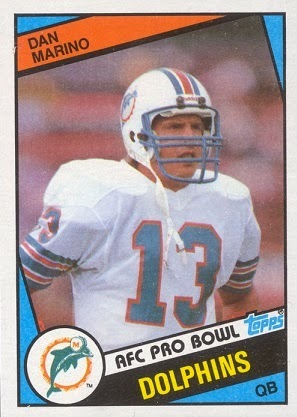 The Dolphins made it to the AFC title game again in 1985, but failed to reach the Super Bowl during the remainder of Marino’s 17-year career. With his ability to get the ball away in a hurry plus excellent protection, he rarely was sacked and proved to be durable, putting together a streak of 145 consecutive starts in non-strike games before an Achilles tendon injury sidelined him five games into the ’93 season. Overall, he led the NFL in passing yards four more times, TD passes twice, completions five times and attempts on four more occasions. The Dolphins were 147-93 with him behind center, 8-10 in the postseason. Upon his retirement, Marino was the league’s career leader in passes (8358), completions (4967), TD passes (420), and passing yards (61,361). The Dolphins retired his #13 and he was inducted into the Pro Football Hall of Fame, Class of 2005.